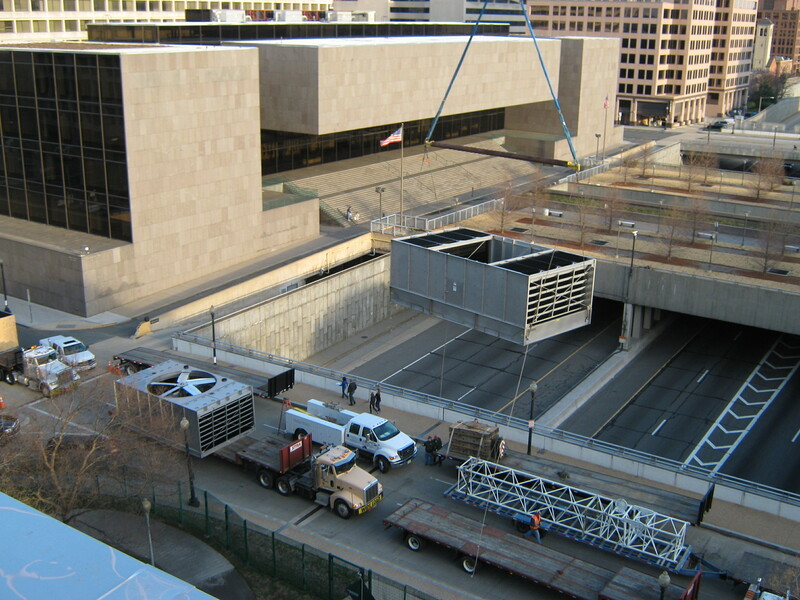 We designed replacement cooling towers for the Frances E. Perkins Building, located at 200 Constitution Avenue, NW, Washington, DC, spanning the opening of the I-395 3rd Street tunnel under the National Mall. This project provided three 1,600 ton cooling towers. Each tower was made up of 4 sections, each weighing over 5 tons. A key challenge that we addressed during design was to understand how the cooling towers could be rigged into place. To address this challenge, we assembled a design team made up of mechanical engineers, a rigging consultant, and structural engineers. The use of a helicopter was considered and eliminated due to the proximity of the US Capitol Building. A traditional crane would be required to lift the cooling tower sections 170 feet beyond the face of the building and over the cooling tower enclosure which had a top elevation of 100 feet above grade. At that time, the largest vehicle mounted crane on the East Coast was the 350-ton Grove GMK 6350. The GMK 6350 required the use of the D Street NW face and required another crane to assemble it. The structural engineer precisely located the crane outriggers and the associated outrigger timber support rafts, with two outriggers resting on the Interstate 395 wall below. The contractor had to excavate around the northeast outrigger to provide a leveled timber support raft. The crane lifts were completed on 19 March 2011. The entire operation was an impressive display of engineers, contractors, and owner working together to achieve a safe result with no impact to the I-395 traffic below.